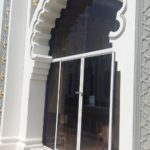 I had planned this post as a standalone to my other Malaysia trip posts as soon as I left the Kapitan Keling mosque in Penang and, in view of the bombing in Manchester, which has now been claimed by Muslim terrorists, today seems the right time to write it. I love religious architecture; the grand scale, the intricate detail, the commitment to beauty. As I mentioned in my previous Malaysia post, the temples were one of the things I couldn’t wait to visit on our trip. I’m fascinated with churches, despite being a firm atheist, and will always seek out grand religious buildings whenever we’re on a trip. Yet I’ve never been in a mosque. 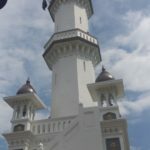 On one of our visits to George Town, capital of Penang Island, we walked past the Kapitan Keling mosque – a stark, white building in the middle of the city, with it’s strong arches, rounded domes, and towering minaret. We took some pictures from the outside and were spotted by a volunteer in the foyer, who invited me in. I was given a scarf to cover my head (I was already dressed conservatively, with my legs and shoulders covered because of the possibility of visiting religious sites, but people who were dressed in strappy tops and shorts were cordially invited in and given clothes to cover themselves) and the young female volunteer began to tell me about the history of the mosque, and more about the Muslim faith. 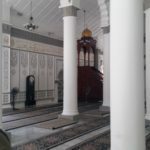 I was struck by the simplicity of the inside of the mosque. In contrast to churches, and the Buddhist and Thai temples we had visited earlier in our trip, there were no physical depictions of Allah, no decorations or ostentatious shrines. 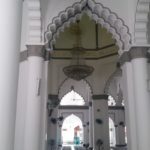 My guide explained to me that Allah’s physical appearance was never described anywhere in the Koran and so there are no imaginations of what he looks like anywhere – not just in a mosque but in every day life. Also, it is against the religion of Islam for any person or animal be represented in a mosque, part of which is that it can lead to idolatry, and also that there is no distraction during the praying process. Praying is a direct connection between the individual and Allah. She explained to me about the pre-prayer washing process, which has to be done in a particular order, and that prayer water is inhaled into the nose and mouth for healing and purity reasons. She explained to me about the call to prayer, and prayer times – I incorrectly thought a prayer time had to be adhered to exactly, but she told me that as long as prayer is taken between the first call to prayer time and before the next call to prayer then that’s acceptable. She pointed out the segregated women’s prayer area, showed me the Koran, and read the Islamic prayer which is said to Allah 5 times each day. It was incredibly enlightening, calming and interesting. When I left the mosque she gave me some leaflets to take away and, because I’d been gone for a while, the husband joked that I’d been radicalised which is just the kind of sense of humour we have but not quite so funny in view of recent events. When we got back to the hotel I sat and read the leaflets (more inappropriate radicalisation jokes!) which are designed to dispel some of the myths, rumours and negative press that Islam gets across the world. I’m not here to preach or change people’s minds, or even to share the content of the leaflets, but the way they approach common misconceptions was definitely an interesting read, and something I believe a lot of people could benefit from reading (EDL and Britain First members, I’m looking at you). Whenever there’s a terror attack, the level of vitriol towards the Muslim community rises, and it’s so often misplaced – aimed at innocent people who simply believe in a religion and a God who is there for them; in the same way as a Christian or Catholic may believe in religion and God. We don’t turn against Christians when a Christian fundamentalist commits a murderous crime. We don’t see the religions of criminals reported in the news – unless they’re Muslim. Crimes committed by Muslims in the name of Islam are anything but what they profess to be. They are extremist individuals who have a twisted view of “their” religion and the world at large, and try to justify a thirst for blood and an anger against a perceived threat in the name of a God who would deplore such actions. 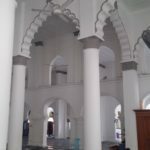 Apologies if there are any inaccuracies in my writings about the mosque, but that’s the information as I recall it.